With the release of my novel, EVANTHIA’S GIFT, I’ve been reblogging recipes that have been mentioned by the characters. Anastacia and Soula bake for the holidays, throw parties for the neighbors and cook elaborate meals for their families. As their daughters, Sophia and Demi, grow to adulthood, they too learn the recipes that have been handed down from generation to generation. This post for kourabeithes was written five years ago, long before I wrote the book. But this is how I grew up and learned to cook; from my yiayia and my mother. 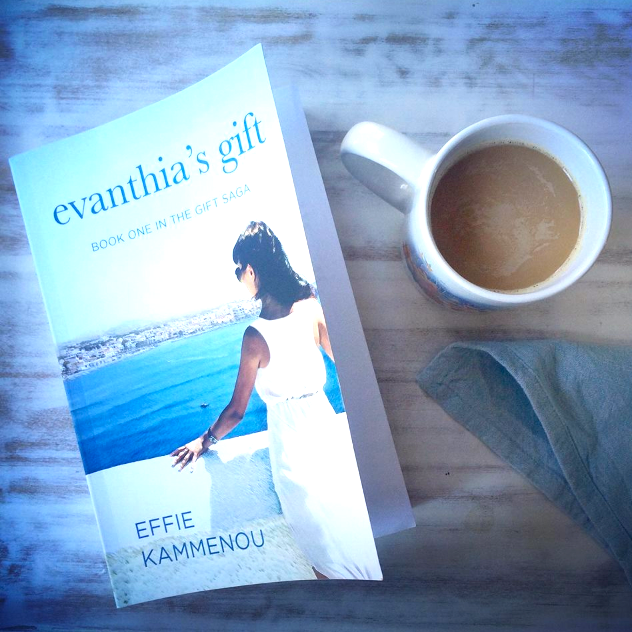 EVANTHIA’S GIFT is more than an account of two women who found true love. It’s love in every sense. Agapi – love. The love of culture, heritage, family, history, food. It’s a reminder to be proud of who you are and where you came from. And it’s a reminder to hold the ones you love close to your heart and truly appreciate them. Originally, made this entry during the holiday season of 2010. I think I mentioned at Thanksgiving that my family is imbedded in tradition and I don’t think that’s about to change, nor do I want it to. With the release of my debut novel, EVANTHIA’S GIFT, I will be reposting recipes that are mentioned in the story. Food always plays an important role in the lives of the Greek people, and for this reason, I’ve included a few recipes within the novel. Below is an excerpt where baklava is mentioned in one of the chapters. 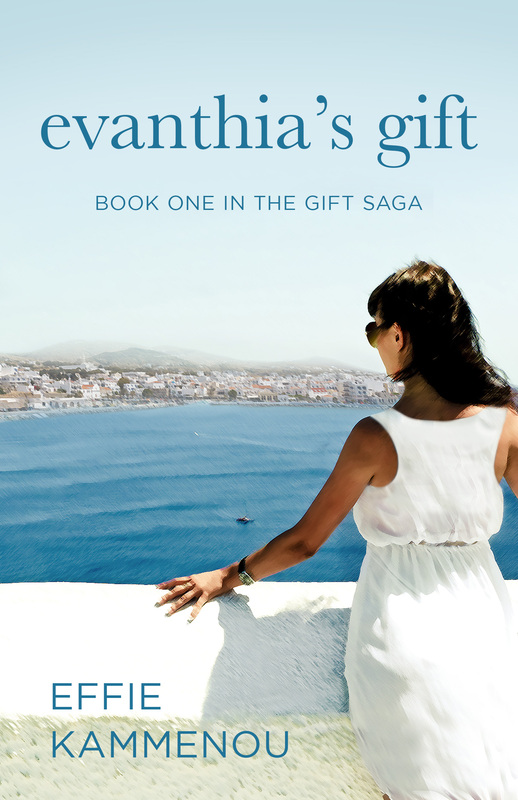 EVANTHIA’S GIFT is available on Amazon in print or on kindle. First, don’t be intimidated by the phyllo. It does dry fast so you need to work quickly. I’ve seen it suggested that covering the phyllo with a damp towel would keep it from drying or flaking. This doesn’t work for me—it makes the dough mushy. I keep Saran wrap on top of the sheets I am not working with. The regular long size phyllo is great when I double the recipe and make a large pan. (The size of a full size sterno pan). If you find the shorter phyllo sheets the smaller pan fits perfectly with the sheet size. I use a Pyrex baking dish and it works beautifully. Brush the inside of the pan with some melted butter to coat. Lay two phyllo sheets in the pan. Brush the phyllo with butter using a pastry brush. Repeat three more times. The bottom layer will have eight sheets in all. Spread 1/3 of the filling onto the phyllo. Lay two sheets on top of the filling and brush with melted butter. Repeat two more times. Spread another 1/3 of the filling on the phyllo. Lay two sheets of phyllo and brush with melted butter. Repeat two times. Spread the last 1/3 of filling on the phyllo and cover with two sheets of phyllo. Repeat three more times. The top and bottom layers should have eight sheets. The layers in between the filling should have six sheets and there should be three layers of filling. Carefully, cut the baklava into squares and then cut each square diagonally to form two triangles. This must be done before baking or the top layers will crumble if you try to cut them after baking. If you have any leftover butter, drizzle it over the top before baking. Bake at 350 degrees for 30 minutes, then lower temperature to 300 degrees and bake for an additional 30 minutes. Check the color after the first 30 minutes. If the top is golden, and the color is where it should be, lay foil on top to keep it from getting too dark. Do not wrap; just lay it on top. The syrup should be cooled if you are pouring over hot pastry, or the pastry should be cooled and the syrup can be hot. I prefer the have both slightly warm when I pour the syrup. I like to let the syrup absorb into the baklava for a day before I serve or wrap for gift platters. This is actually one of the easiest pastries to make. Once you get a feel for handling the phyllo it’s a breeze. 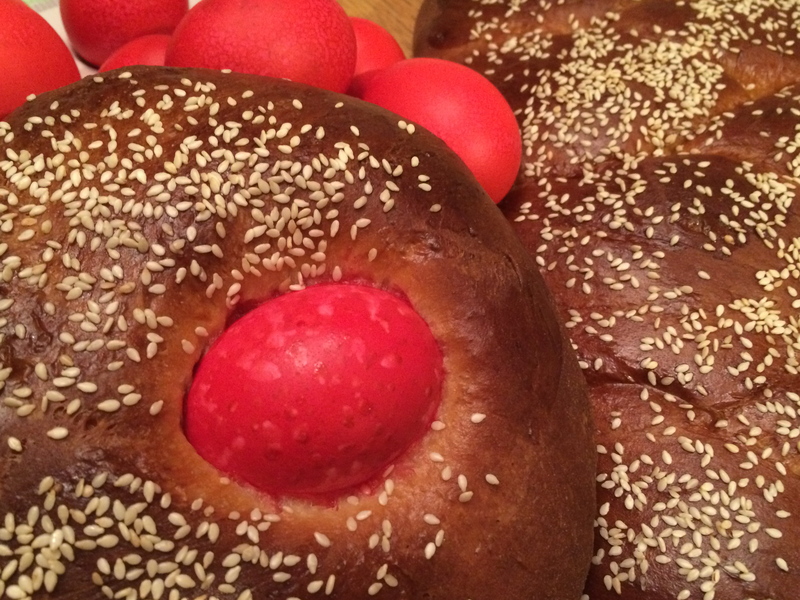 I have been trying for years to master this traditional Greek Easter Bread. I’d watched my mother make it since I was a child, and as an adult I’d followed her recipe. But as delicious as it was, it didn’t have quite the same texture as the ones we would buy at the Greek bakery. Mom’s was sweet and tasty, but dense – not light and fluffy like the store-bought ones were. So for years, I’ve tried to crack the code — discover the secret — find the perfect recipe. What I discovered was that there wasn’t anything wrong Mom’s recipe. The problem was in the execution, and my nemesis was the yeast. Apparently, I didn’t understand the meaning of lukewarm. I now know that for the best results, you want the water to be the same temperature as your finger, otherwise, the yeast will not rise to its full potential, if at all. This year, I was determined to make the best batch of tsourekia, so I consulted a panel of experts — avid bakers on a Greek Facebook page. After taking the advice from several women, I decided to keep my mother’s measurements but alter her method a bit. And I am satisfied with the result. I get to keep my mom’s recipe in the family, yet at the same time, use it in a way that works for me. To all my non-Christian Orthodox readers, I hope you had a wonderful Easter and Passover. And to all those anticipating Easter, Kali Anastasi! In a bowl add the lukewarm water to the yeast along with the dash of sugar. The temperature of the water will decide if your bread will be a success or an epic fail. I have had both. The water should be the same temperature as your finger. Any warmer and it will kill the yeast. Place saran wrap over the bowl and set aside for about 10 minutes. In a saucepan, add the butter, milk and sugar. Stir until the butter has melted. Do this over a low temperature. Remove from the pan and pour into a large bowl. Allow the mixture to cool to lukewarm. Whisk in the eggs. Add the orange juice, zest, mahlepi and mastiha. Add the yeast mixture and whisk to combine. In the bowl of a standing mixer, add the four and salt. Add the wet ingredients. Attach the dough hook to the mixer and mix on low speed for 1 minute. You may need to shut the mixer off and scrape the sides with a spatula. Mix at medium/high speed for 15 minutes. The dough will be a little sticky, but will begin to pull away from the bowl. Transfer to a separate bowl, cover with a linen cloth and keep in a warm place for 2-3 hours. If you can’t find a warm enough place, I suggest you preheat your oven to 200 degrees and then shut it off. Place the bowl in the oven. When the dough has risen, gently deflate the dough with your fists and divide into 3 or 4 equal balls, depending on how large you want to make your breads and how many. Each ball will then be divided into three equal sections and stretched long enough to form a braid. 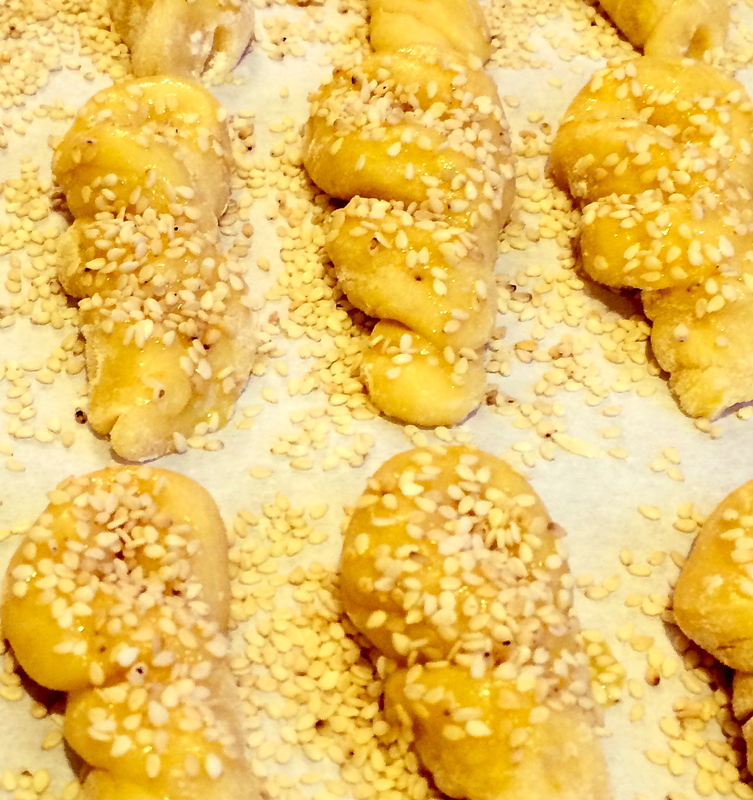 Form each braid on a parchment-lined cookie sheet. Place a linen cloth over them and let them rise in a warm place for 1 hour. In a small bowl, add 1 tablespoon of water to the egg yolks and whisk. Carefully, place a red Easter egg at the large end of the braid. With a pastry brush, gently coat the top of the bread with the egg and then sprinkle with sesame seeds or almond slices. Bake in preheated oven set at 350 degrees for 40 minutes. What is Cheffie to do on a frigid day when the wind is gusting and the snow is predicted to accumulate to thirty inches? With nowhere to go, Cheffie spends a good part of the day in the kitchen. I have a leg of lamb in the oven, and when my family comes home they instantly recognize the aroma of the garlic cooking inside the slits of lamb I’ve stuffed into it. “It smells like Yiayiá’s house,” my daughter says, and for me that is the greatest compliment. What to make for dessert… I want to taste the flavors of summer. Truth be told, I just want summer. Period. Nothing reminds me of the sun and warm weather more than citrus. 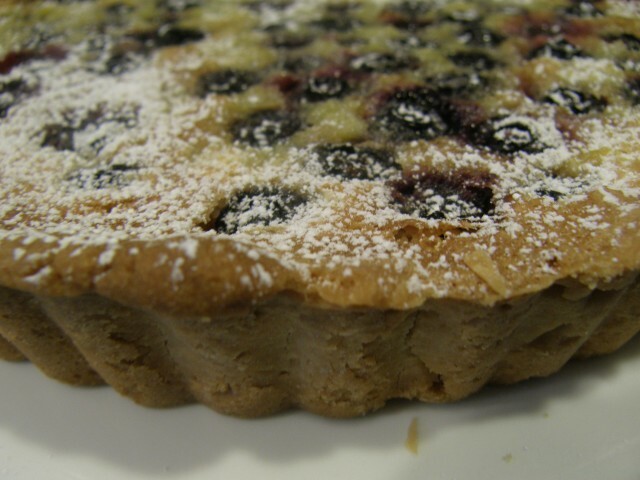 So for a little bit of sunshine on a blistery day, my lemon blueberry tart will do the trick. In a bowl, cream butter and sugar. Add salt, vanilla, and flour. Mix until blended. Form a ball and flatten to a disc. Grease a two-piece tart pan. Press the dough evenly into the pan. With a mini rolling pin smooth the dough inside the pan. Depending on the size of your tart pan, you may be left with unused crust. Bake for 20 minutes or until the edges are golden. In a large bowl, mix sugar and flour. Whisk in eggs until smooth. Stir in lemon juice and zest. Fold in berries. Pour filling over crust and return to oven for about 30 minutes or until filling sets. Let cool in pan on a wire rack. When the tart is completely cool, remove rim from tart pan. The bottom will easily separate by sliding a knife under it. Sprinkle with confectioner’s sugar. Tonight I finished the last of my holiday baking. It’s been quite a week or so trying to fit the baking in between my job, gift shopping and wrapping and all the other obligations that consume my day. But It’s done! 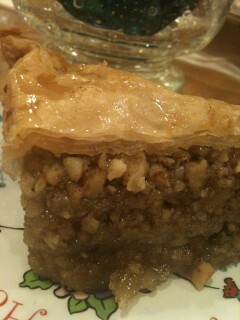 I spent the better part of the evening making baklava and revani. Tomorrow, I’ll begin to put the many platters of pastries together. I do wish for each of you for your holidays to be filled with laughter and the makings of happy memories with family and friends. For me, the next two weeks will be busy visiting and entertaining cherished friends and my wonderful extended family—and that is truly what makes this season special. These traditional Greek Christmas cookies are one of my favorites. Plain, but delicious, they are great with a cup of tea or coffee. Forming each cookie is the longest part of the process, however, they are one of the simplest cookies to make. If you have any leftover after the holidays, don’t hesitate to freeze them. They taste just as good when thawed. I remember watching my mother make these cookies and asking to help her. For years, I only got to do the “grunt work”—Juicing the oranges or cracking and beating the eggs. She didn’t trust that I would form the shapes to her standards. But I learned from watching and eventually she let me do the “fun” part. And now I carry on the tradition she set for our family and pass it down to my own children. In a bowl, mix together the flour and baking powder. Set aside. In a separate bowl, mix together eggs, sugar, orange juice and zest. In a large bowl, cream butter. Add the egg mixture, blending well. Mix in the flour. Form a dough that can be worked without sticking to your hands. If necessary, add more. Roll into small braid-like twists, circles, and S’s. Lightly beat an egg with 1 teaspoon of water. Brush the egg mixture onto each cookie and sprinkle sesame seeds. Bake for approx. 20 minutes. Yields approximately 120 cookies. This time of year my home turns into a cookie factory. 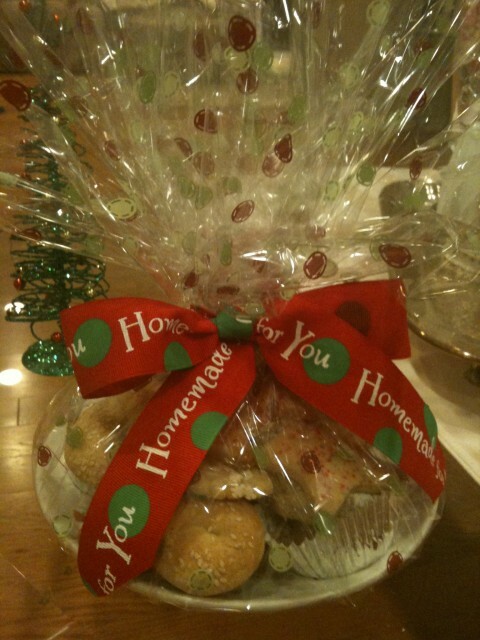 Each Christmas, my mother baked traditional Greek pastries and cookies and gave them out to friends and neighbors. I carried on that tradition—times ten! When my girls were in grade school there were so many people to give gifts to—classroom teachers, music teachers, dance and gymnastic teachers, and classroom aides. Honestly, the last thing any of them needed was another mug or #1 teacher paperweight, so I gave each teacher a tray of Greek cookies. They were unique and not at all like the usual Christmas cookies they’ received in the past. I continued this right through the girls’ high school years, even though there were several teachers to remember. In order to bake the number of cookies I do in such a short amount of time, I need to stay focused and organized. I don’t want to loose sight of the reason and feeling behind the holidays. I don’t want the baking, decorating and shopping to become a chore. I want it to be something to look forward to and to enjoy with my family. It saddens me that we work ourselves to exhaustion for that one day or even eight days for some of my friends, but then we feel let down in the end. It’s not that the gifts weren’t good or the gathering with family wasn’t fun. We are let down because we didn’t enjoy the journey of the whole season and after all the planning and preparing, it was over in the blink of an eye. I like to watch corny Hallmark Christmas movies while I bake and wrap gifts. I choose less crowded times to shop and enjoy finding the perfect gift for each person. Driving through my neighborhood is like being on the set of a Christmas movie. Each home is beautifully decorated, and I love driving around blasting Christmas music. I think if you enjoy the whole season, you will appreciate the day itself. Whenever I see old friends or someone mentions my mom and coming to our home when we were children, it seems that the same comment is made across the board—Those cookies your mom made with the powdered sugar were my favorite. To this day I get requests to make them or to share the recipe. 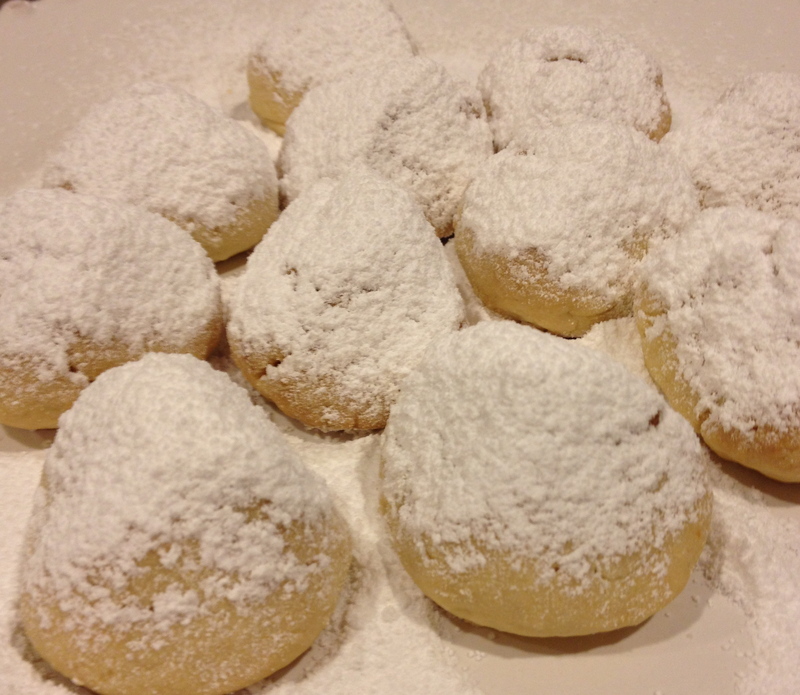 Yesterday, I kicked off my baking marathon by making the famous Kourabeithes—butter cookies with crushed toasted almonds, blanketed in powdered sugar. My husband’s family calls them Petedespina cookies, named after My Aunt Despina and Uncle Pete who made platters of these cookies for each table at my wedding. You’ll find these cookies in a few shapes—crescents, discs (like my mom made them), or pyramid shaped. Aunt Despina made the pyramids and I always liked that shape the best, so although I use my mom’s recipe, I don’t make them the same shape she did. These cookies are easy to make, taste just as good after freezing and thawing, and they’re a crowd pleaser. This recipe yields about 140 cookies. Toast almonds in oven for about 15 minutes at 350 degrees. Cool. Zest and juice one orange. Cream butter and Crisco shortening. Add crushed almonds. Add zest, juice, vanilla and baking powder. In a separate bowl, beat eggs and sugar, then add to the butter mixture. Add half the flour and mix well. Keep adding flour and mix with your hands until you get soft dough that can form a shape and not stick to your hands. You may not necessarily use the whole bag of flour. Shape into circle, crescent, or pyramid (similar to a Hershey kiss). Bake at 450 degrees until tops just begin to get slight golden color. The cookies should still be somewhat pale when you take them out. The amount of time in the oven will depend on the shape. I would say about 12- 18 minutes. The kiss shape takes the longest. Sprinkle with rosewater if you choose to use it. Cover the cookies with powdered sugar. These freeze great. If you want to make weeks ahead, store them in a large container and freeze. Do not sprinkle with rosewater or powdered sugar until thawed. Still inundated with apples, I baked another family favorite that I discovered could be frozen and used for Thanksgiving. 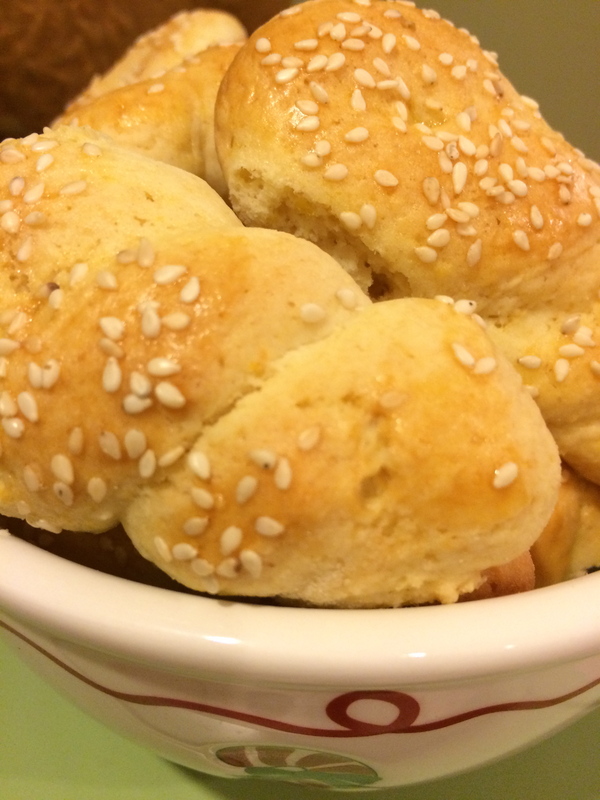 This apple “bread” is really not bread at all. It has no yeast—it’s more of a cake, but one I serve with dinner. I like to fill a breadbasket with squares of cornbread and apple bread to pass around the table, accompanied with maple syrup butter. So where did this bread get it’s name? From my daughters’ AP literature teacher. Although an educator for over 30 years, Ms. Murray-Wilke was dedicated and enthusiastic until the day she retired. A passionate baker, she would bring cookies and cakes for her classes to enjoy while they discussed anything from Pride and Prejudice to Shakespeare or even Harry Potter. Her students adored her and many still keep in touch with her. She was generous enough to share her recipe, and when Alexa came home with a copy of it she begged me to make it, and the rest is, as they say—history! The ingredients remain the same, though I changed the method just a bit from the original copy. 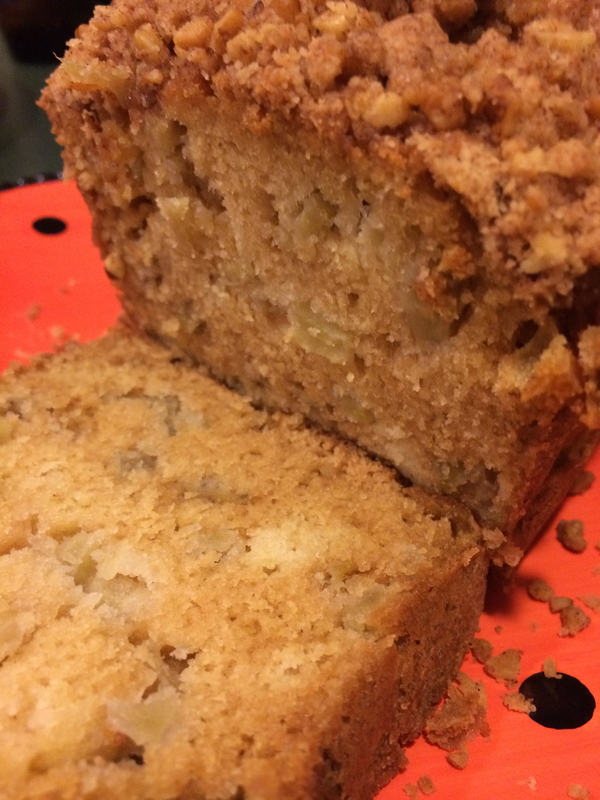 *Just an idea- If you are looking to give a small gift to a friend or neighbor, or to bring a hostess gift to a party; this apple bread would make a wonderful gift. Simply wrap in cellophane and tie with a pretty bow. *Hint- I like a lot of topping. I double the amount of topping on each bread. The choice is yours! Make the topping first and set aside. Cream butter and sugar. Add flour, cinnamon and nuts. Mixture should resemble coarse crumbs. For the batter- cream butter and sugar until light and fluffy. Add eggs and vanilla, blend well. In a separate bowl combine flour and salt. Stir flour mixture into egg and butter mixture. Dissolve baking soda in buttermilk: add to batter, mixing well. Peel and dice the apples now that the batter is done. I find that there is less of a chance of the apples turning brown this way. Stir in apples. Spoon batter into a well-greased and floured 9×5- inch loaf pan. Sprinkle with topping. Bake for 1 hour. Cool slightly before removing from pan. Cool on wire rack. Columbus Day seems to be the day my family has traditionally chosen to go pumpkin picking. Some years the weather was cold—well by Effie standards anyway and other years it’s been warm. This year it was close to 80 degrees and I’m not complaining. For several years we tried to go pumpkin and apple picking in the same day. After discovering that the only apples left by October were the ones that either fell off the trees or that were discarded by the people who picked them in September, we knew we had to change our plan. 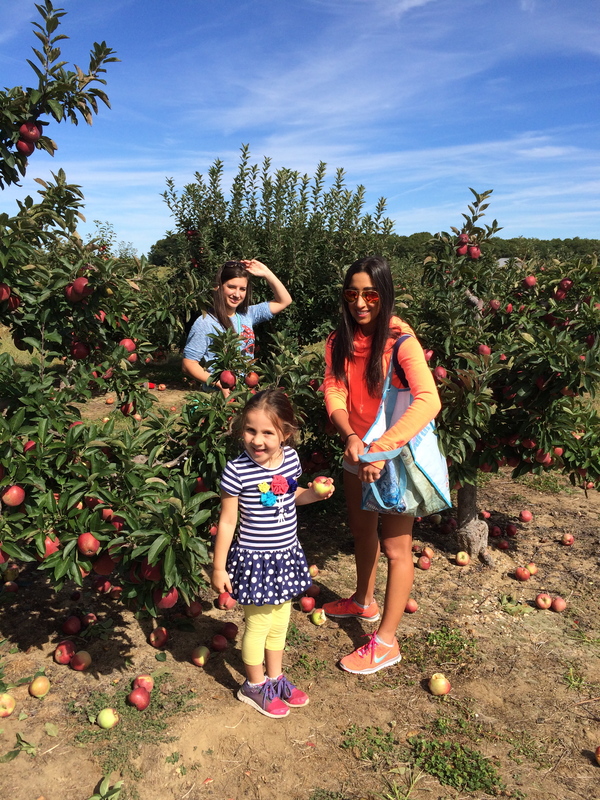 So in Mid-September we went out East with our little niece and nephew and picked the most beautiful apples. 36 pounds later, I had to create something—a lot of something. Needless to say, the next few blogs will be dedicated to apples. On Halloween and Thanksgiving I make a tray of apple crisp. Last year I discovered I can freeze it and heat it after defrosting and the result is the same. This makes me sooo happy! It takes one project off me in the days leading to Thanksgiving. I made three trays of Apple crisp. The extra is for my neighbor, Richie, who waits every year for “apple crisp” season. But then, I got a brilliant idea! 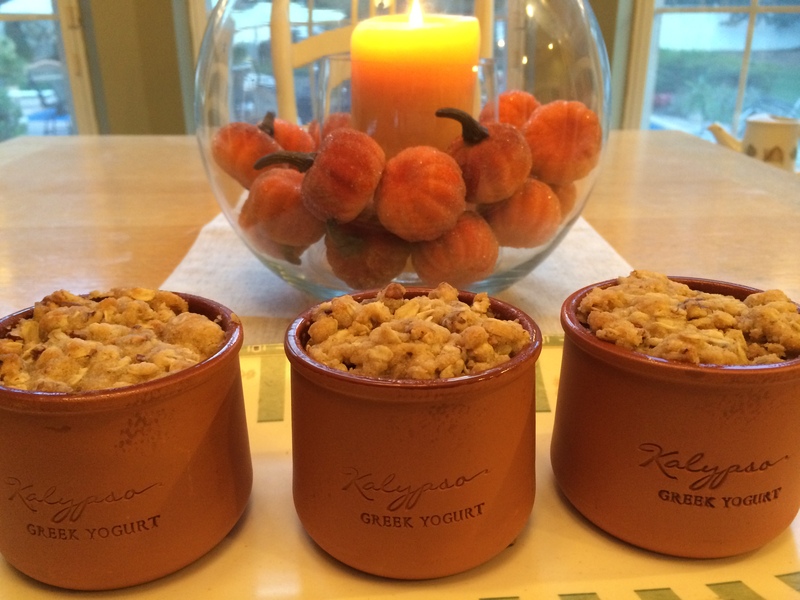 I’ve been collecting these little clay pots that Kalypso Greek yogurt is packaged in. I thought it would make a nice presentation to plate my apple crisp in individual servings for my Thanksgiving table. I did make other apple recipes with the 36 pounds of apples. You will have to wait and see what they are. In the meantime enjoy this easy-to-make apple crisp. When I am doing anything with apples I am conscious of them turning brown. For this reason I prep as much as possible ahead of time and leave the peeling of the apples for last. Make the topping first and set it aside. Simply mix all the topping ingredients together and mix well. For the filling – In a large bowl, stir together the brown sugar, flour, and cinnamon. Melt the butter, juice and zest the lemon. As I peel a few apples I toss with the lemon juice. I keep adding apples and lemon juice as I keep peeling to coat well. The lemon juice keeps the apples from turning brown. After the apples are peeled, add the melted butter, the brown sugar mixture and the vanilla, tossing well to coat. If you are planning to freeze, I suggest reducing the cooking time by 10 to 15 minutes. Let the apple crisp completely cool before storing in the freezer. Serving suggestion- Spoon vanilla ice cream or Greek yogurt over the warm apple crisp.